Each year camera manufacturers release new point-and-shoot models at the Consumer Electronics Show with more megapixels, thinner frames, and larger screens. While some may consider those major improvements, it begins to get repetitive for gadget enthusiasts. 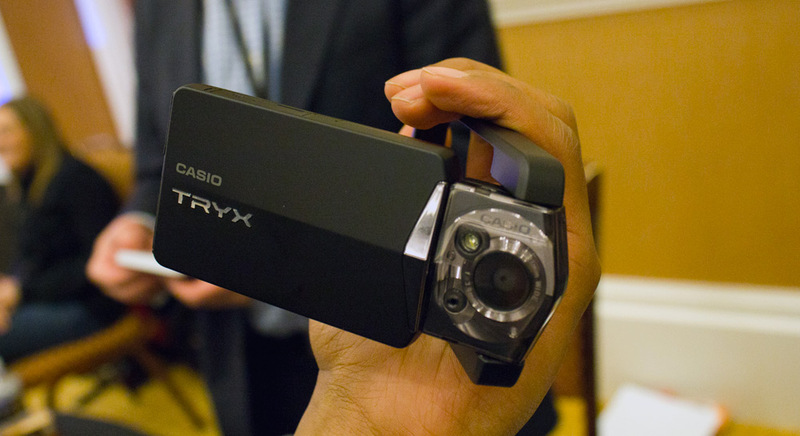 And that’s exactly why I find Casio’s new Tryx camera exciting. Unlike the majority of new sleek point-and-shoot cameras that are incredible difficult to hold, the Tryx changes the game with a new twist and turn exoskeleton. The external frame hinges onto just one end of the Tryx camera and can rotate a full 360 degrees. 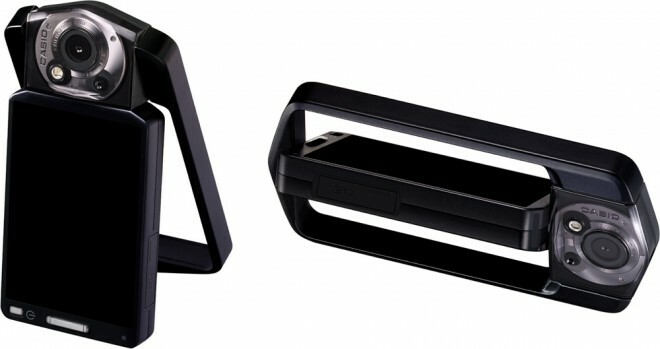 This lets users hold and aim at just about any spot from almost any angle. As for the technical specs, it features a 12 megapixel image sensor and can record 1080p videos. For storage, the camera supports the standard SD and SDHC memory cards. The standard goodies found on most recent digital cameras including auto focus, macro mode, spot metering, white balance settings, ISO settings, self timer, flash configuration, and a USB connector are available. The Casio Tryx even offers a HDR mode, which is becoming quite popular with photographers. The 2x zoom is the only noticeably lacking feature. The TRYX also includes some neat features such as a motion activated timer mode. After configuring the camera to monitor for movement in a certain area of the LCD, groups can position themselves for the best shot without frantically trying to beat a timer. A simple wave of a hand or foot in the marked area will trigger the camera. Casio also allows users to select images and videos for posting on social media networks straight from the camera interface. Once connected to a computer, the camera will automatically upload images to compatible services such as Facebook, Flickr, or YouTube with no additional software. Casio is clearly targeting a youth-oriented demographic with this new camera. With a premium $250 price, the twisting frame may seem confusing and unnecessary for many. However, I see the TRYX as a perfect fit for those with an active lifestyle who always want to snap photos or record a HD video in suboptimal settings. For those looking to buy one, the TRYX will be available this April.